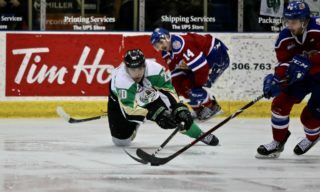 Kamloops, BC – The Prince Albert Raiders (39-5-0-1) extended their winning streak to four games with a 4-1 victory over the Kamloops Blazers (15-24-2-1) on Friday night at the Sandman Centre. Brett Leason had a goal and an assist in the win, while Max Martin and Sean Montgomery each chipped in two assists. The Raiders got out to a quick start 28 seconds into the contest. 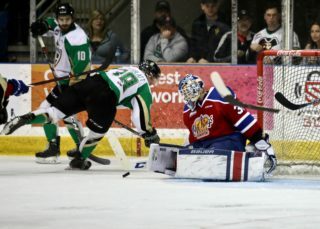 Leason collected a puck in the neutral zone and his shot from the top of the faceoff circle fooled Blazers goaltender Dylan Garand to put the Raiders ahead with his 31st goal of the season. SCORES! @Bleason7 nets his 31st goal of the year! Kamloops tied the game at the 5:53 mark of the frame. Zane Franklin’s shot was turned aside by Boston Bilous, but the rebound found Jackson Caller who backhanded the puck into the empty side of the net. It was the rookie’s only blemish of the first period in his first start as a Raider. Midway through the period, Connor Zary blocked a shot and was sprung on a breakaway, but the Blazers forward was denied by Bilous. Before the end of the period, the Raiders restored their lead. Cole Fonstad entered the zone on the right wing and put a low shot on goal. Ozzy Wiesblatt was driving towards the net and redirected the shot past Garand for his 10th of the year. SCORES! @ozzywiesblatt redirects @ColeFonstad‘s shot past Garand! Bilous and Garand kept both teams off the board in the second period, each making 10 saves respectively in the frame. The best save of the frame belonged to Garand, who sprawled to his right to rob Fonstad of a sure goal. Early in the third, the Raiders extended their lead. On the ensuing faceoff following a Blazers’ icing call, Dante Hannoun won the draw back to Martin. 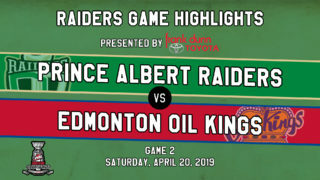 The Raiders defenceman put a shot on goal that was redirected by Hannoun in the slot and past Garand for his 21st goal of the season and 100th of his WHL career. SCORES! @hannoun19 stationed in the slot directs a shot past Garand! Late in the frame, a great passing played wrapped up the game. Montgomery found Leason with a cross-zone pass. Then, Leason found a driving Justin Nachbaur who tipped it in on the near side for this 12th of the year with 4:20 to play. SCORES! @Jnacks55 finishes off a great passing play for his 12th of the year! 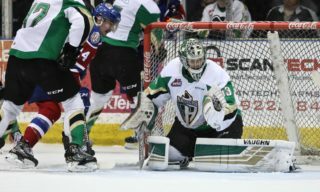 Bilous kept the Blazers at bay for the final four minutes, stopping all 10 shots faced in the third. In total, the Langley, BC product made 29 saves to pick up his first win as a Raider. Garand made 22 saves, including a few highlight-reel ones, in the loss. 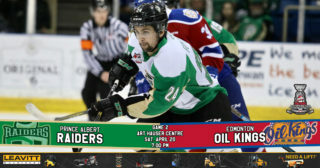 The Raiders continue their BC trip on Saturday night in Kelowna against the Rockets (17-22-3-1) at Prospera Place. Puck drop is 9 p.m. Catch the game at The Rock And Iron Sports Bar at the Prince Albert Golf and Curling Club or listen on 900 CKBI.